Service in education has been a longstanding tradition in the university experience. Service projects not only help students acquire practical skills and career experience, but they also help organizations and individuals in the community. This serves to further strengthen the bond between university and community, as well as between individuals. Additionally, providing service enhances students’ world view, increases empathy, and provides unique experiences. The service aspect of an education should not be overlooked. In an increasingly competitive job market, career-specific service experience can provide an edge and hook to prospective employers. The service project can develop skills and provide opportunities that would have been otherwise missed. The experiences within one’s field also allow students to fine-tune their interests – developing a specialty they wish to further pursue. This real-life and hands-on experience is as integral to the education process as learning in a classroom or online. “It’s all about who you know.” This adage is particularly pertinent when job hunting. Many of the students find their community service contacts from their college project to be their bosses after graduation. If not working directly for these contacts, former supervisors are a valuable source for crucial letters of recommendation. The networking established during college, though service projects, is an invaluable resource when the time comes to get a job. Getting your foot in the door can be challenging – and networking is the true key to successful job hunting. The power of community connection is vast. Between a diploma, a list of contact in your field, work experience, or strong community connection – it is the community connection that will bring you the most success. 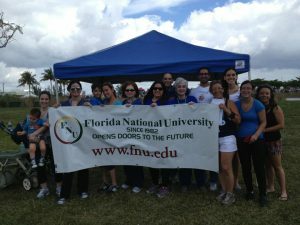 Florida National University is invested in its community and actively facilitates service programs with organizations including; Reading Time, Ultrasounds for the Community at the FNU Ultrasound Laboratories, and PCT Hospital Volunteers at Jackson Memorial North Pasteur Medical Center. These programs provide invaluable experiences, contacts, and community connection for students who participate. Service is possibly more valuable to the student as it is to the community. By providing additional education, real-world experience and personal growth, service projects are championed by FNU for their ability to accelerate and enhance develop well-rounded students. Offering rigorous programs, both brick-and-mortar and online, Florida National University is a respected higher education institution. With entirely online programs providing flexibility, FNU is opening up opportunities for students all around the world. If you are interested in more information regarding the Florida National University service programs please call 305-821-3333 ext. 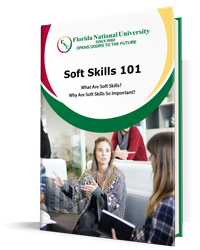 3 or visit https://www.fnu.edu/service-learning/ for specific contacts and resources.